The Vario is a genuine allrounder. It will suit all but the tallest riders for some jumping, but the flaps are not so forward cut as to look out of place in a dressage arena. 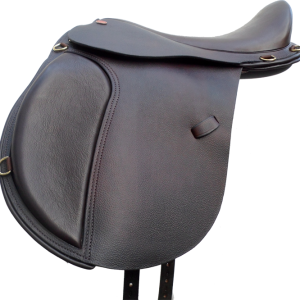 It is eminently suitable for hacking, but it is also used by some competitive endurance riders, who prefer to ride with shorter stirrup leathers. 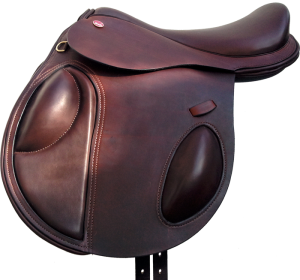 The Vario is built on exactly the same tree as the dressage and endurance saddles, it also has the same panels. 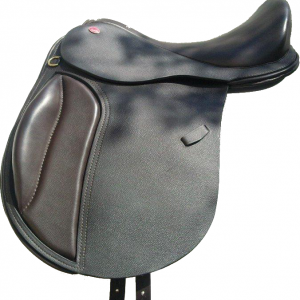 The fit for the horse is therefore identical, but the rider can ride with a more angled knee, due to the slightly forward-cut flaps giving extra room. The knee pad can be made with the small roll, or a plain pad. It can be equipped with the same set of D-rings as the St.Christopher if it is to be used for endurance or long hacks. 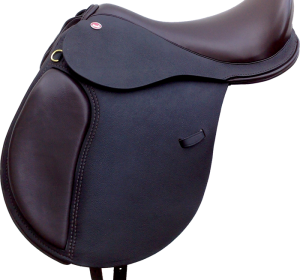 The Strada Duo-Jump is again built on the same tree as all the other Strada models, but the cantle is at a shallower angle and, so as not to interfere with a rider jumping a drop fence. The flaps are sufficiently forward-cut to allow riders to shorten their leathers, yet still leave the horse’s shoulders free to move. The knee and calf blocks give the rider good support over a fence. The Duo can also be made with a plain knee pad, instead of the knee and calf blocks, for riders who want to use it as a GP . It will suit tall people and big horses, while smaller riders and horses would be more suited by the Vario The Duo can also be equipped with D-rings for luggage.